As with everything in the strength and conditioning world, there are many factors at play when it comes to improving a hockey players shot. If was as simple as one exercise you could incorporate into your training then that would be great because then I could just list the exercise, sets and reps and send you on your way. 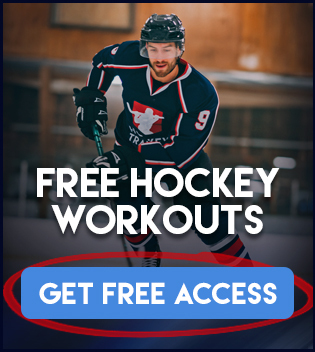 But, I take a lot of pride in only offering the readers of my HockeyTraining.com articles the top information available. 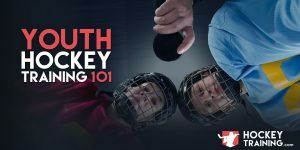 And the best information normally involves backtracking a bit to make a few points before I am able to make my big point – which in this case is going to be improving your hockey shot with sport specific training. • What angle you’re at with the net in the time of shot release? • What stance are you in at time of release? • Did you have time to load up? • Is your shot technique on point? These are just a few examples of things that are critical to your shot performance on the ice that go outside the scope of the gym floor. As far as angle on the net, stance and load up — that is entirely position-based and falls mostly into offensive/defensive awareness on the ice. Lastly, technique is a make or break for you. You can do everything I tell you to do in this article to improve shot power development but if you don’t have the proper technique to execute and express that power then your first priority is to learn the proper shot technique. If you’d like to learn more about improving your hockey shot join our VIP Program here! These things all tie-in with each other. It’s not always the man with the most powerful shot who is scoring all the goals. A slow release can make a hard shooter seem like a slow shooter, giving the goalie and the other players that extra second in order to predict the path of the puck. Whereas a guy who may have a weaker shot as far as power goes, scores more goals and is seen as the player with the better shot due to his ability to have a very quick release in combination with good accuracy. Technique controls these things and in many cases, shot and puck placement is more important than power. Now having said all this, who wouldn’t improve from a harder shot? Proper shot technique is a must but that can also be trained at the same time as you strength train for shot power development. Or if you already have great shooting technique, power development can turn you into the guy the opposite team does not like to see with the puck. Power development for shot performance can be improved drastically through proper strength training and some modified strongman work. 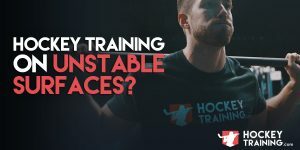 It is not to be trained through these ridiculous imitations of sport specific movement such as adding resistance bands or tubing to your stick and taking resistance/loaded shots. I’ve also seen implements being attached to cable systems while mimicking shot patterns as well. These types of movements actually encourage poor technique and motor patterns. I have talked about the central nervous systems relationship with movement patterns in the past with speed development and th exact same rules apply here. This type of training negatively affects your body’s motor and recruitment patterns during a game setting. Think about it, when you shoot with resistance attached to the stick — you are not moving in the same motor pattern as you do when resistance is not on the stick, this leads to poor movement pattern learning, especially when accuracy is your primary objective. Specific to resistance bands and/or tubing, it creates the opposite resistance profile of the movement. Let me explain. 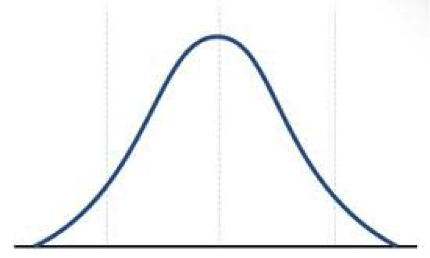 A resistance profile is simply a curve that is measured as you take yourself through a movement and measure the amount of resistance at each point in the movement. For example, everybody knows what a biceps curl looks like. At the bottom of the movement you have no resistance, half way through the movement (at about 90 degrees) it becomes maximally difficult, and then once you get to the top of the movement it becomes slightly easier again. Now think about the resistance profile of a shot with bands vs. without bands. A shot without bands creates a loaded position beginning as you slightly lean back and then explode forward and the only resistance you come across is the puck half way through the movement. Whereas with resistance bands the resistance profile applies more force to your stick the further and further you get in front of your body; meaning, you are at maximum resistance during the follow through of the shot (and not the load up!). So not only does the weight affect central nervous system motor patterns, but the resistance profile of the bands does not positively benefit the shot either. Now, changing the resistance profile with bands/chains during strength training movements can be beneficial to get over a plateau. Such as doing band resisted squats. Band resisted squats make it harder in the top half of the position which challenges your “lockout” muscles greater if the lockout position has created a plateau for you. This forces you to accelerate throughout the whole squat and break through that lockout. The thing is, that is a squat. Your set up and movement pattern are completely identical, just the resistance profile has changed. You cannot compare that to an athletic movement as complex as a shot that involves so many different parts of the body working in unison while simultaneously trying to be as accurate as possible. Another reason you can’t compare the two either is due to the fact that with the band squats you are using them to change the resistance profile to overcome a lockout plateau in the top half of the squat. The bands resistance profile on the shot creates most resistance in the follow through, I don’t think anybody is limiting their shot potential due to not being able to produce force after the puck has already been released? Especially since at that point you are decelerating the stick, not accelerating it. Improving shot power using methods that actually work involves assessing the functionality of the movement and working backwards. True sport specific training to me means observing the biomechanical, physiological and bioenergetic demands of the sport and segmentally working backwards in determining kinetic segments, muscle actions, intensities and energy systems required for each athletes position and/or movement pattern. In the case of improving the shot; the shot is a low load, high velocity rotational power movement, and should be trained as such. Additionally, it is heavily supported by relative strength, specifically in the lats, lower body and core. Exercises like these are going to have a far greater impact on your shot power than doing any type of resisted band/tube work or trying to mimic it with cables. I recommend incorporating the following in a proper periodized manner throughout the offseason to get maximum effect on your shot power come tryouts at the end of August. And then be sure to add your medicine ball work into your regular conditioning regime. This will not only pay dividends to your shot power development but also more accurately represents proper energy system conditioning during hockey.